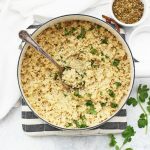 How to Cook Quinoa – These easy stovetop directions for cooking quinoa make it easy to cook perfect, fluffy quinoa every time! Add quinoa, water, and salt to a saucepan. Bring to a boil over medium heat. Boil vigorously for 5 minutes (uncovered), then turn off the heat, cover the pan, and allow to stand (covered) for 15 minutes. Add quinoa, water, and salt to a saucepan. Bring to a rolling boil over medium-high heat. Reduce the heat to LOW and cook an additional 15 minutes. Remove from heat, cover, and let stand (covered) for 5 more minutes. Cooked quinoa will keep about 1 week in the refrigerator.